My friend Pam made me this terrific top for our tree complete with blinking lights. 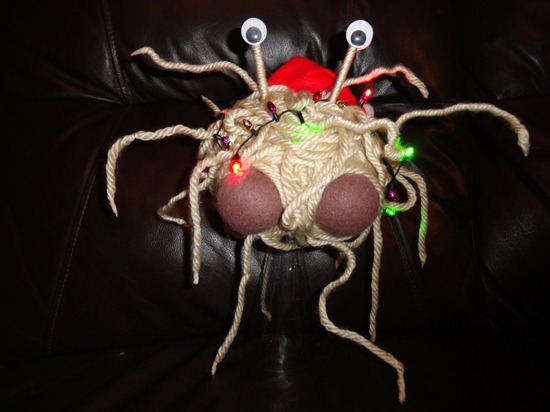 I think anyone would be lucky to have this wonderful image of His Noodlyness atop their chrisFSMas tree! I just hope the FSM is careful…..looks like that red light may burn one of his balls…..but I guess that is the pain and suffering our deity must endure. I agree, creativity is something that some people have….and for those of us that are not so creative, its really awesome to see! Ahhh Is it just me or does this thing look like Safety Sam from the movie “The Groove Tube”? or does safety sam look like our noodly lord? These are just brilliant. I am going to make the time next year to knock some of these decorations up. Since I have a conga line of children I will have no problem getting recruits to help. May He Touch All Of You Who Have Made Awesome Decorations With His Saucy, Noodly Appendage. While He Is At It May He Touch The Lot Of Us! Looks like someone with a pair of leather trousers wrapping his balls with a thread. is this yours pam? the pam online?